CAJAMARCA. BIBLIOTECA ILLUSTRATA DEI VIAGGI INTORNO AL MONDO, PER TERRA E PER MARE - N. 48. L’OKLAHOMA. BIBLIOTECA ILLUSTRATA DEI VIAGGI INTORNO AL MONDO, PER TERRA E PER MARE - N. 40. LA VALLATA DEI GEYSERS. BIBLIOTECA ILLUSTRATA DEI VIAGGI INTORNO AL MONDO, PER TERRA E PER MARE - N. 79. LA SENEGAMBIA. BIBLIOTECA ILLUSTRATA DEI VIAGGI INTORNO AL MONDO, PER TERRA E PER MARE - N. 111. IL NYASSALAND. BIBLIOTECA ILLUSTRATA DEI VIAGGI INTORNO AL MONDO, PER TERRA E PER MARE - N. 86. DALL’ATLANTICO ALL’ALBERT NYANZA. BIBLIOTECA ILLUSTRATA DEI VIAGGI INTORNO AL MONDO, PER TERRA E PER MARE - N. 110. IL PAESE DI HAUSSA (KANO). BIBLIOTECA ILLUSTRATA DEI VIAGGI INTORNO AL MONDO, PER TERRA E PER MARE - N. 46. I BASSUTO. BIBLIOTECA ILLUSTRATA DEI VIAGGI INTORNO AL MONDO, PER TERRA E PER MARE - N. 53. L’ISOLA MAURIZIO. BIBLIOTECA ILLUSTRATA DEI VIAGGI INTORNO AL MONDO, PER TERRA E PER MARE - N. 10. IL POLITECNICO. REPERTORIO MENSILE DI STUDJ APPLICATI ALLA PROSPERITà E CULTURA SOCIALE. RIEDIZIONE ANASTATICA DELLA PRIMA SERIE (1839-44). LE COURRIER GRAPHIQUE. REVUE DES ARTS GRAPHIQUES ET DES INDUSTRIES QUI S'Y RATTACHENT. 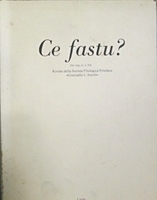 CE FASTU? RIVISTA DELLA SOCIETà FILOLOGICA FRIULANA. COSMORAMA PITTORICO. DIRETTORI: GIUSEPPE E DEFENDENTE SACCHI / G.F. ZINI. CINA. ISTITUTO ITALIANO PER IL MEDIO ED ESTREMO ORIENTE. REDAZIONE: LIONELLO LANCIOTTI. L'INDUSTRIA DELLE COSTRUZIONI. ANNATA 1970. RIVISTA TECNICA DELL'ASSOCIAZIONE NAZIONALE COSTRUTTORI EDILI.